OH, JUST AS AN FYI, THIS POST MAY CONTAIN AFFILIATE LINKS, VIEW MY DISCLOSURE POLICY HERE FOR DETAILS. FAIR WARNING: IT'S LONG AND BORING, BUT IT DOES THE TRICK. Say Hello to the Kaydence Messy Bun Hat! This sweet bun beanie was specially designed for my dear friend who LOVES her houndstooth…and her messy mom bun. Whether you’re a houndstooth fan, a University of Alabama alum, or simply a lover of classic design, this checked bun hat is the perfect project for you (or your friends). Made of super chunky yarn (I used Lion Brand Hometown USA) and a size 10 mm hook (find one here), you can make this hat in less than an hour and fits teens through Women’s medium. The instructions also include ideas for variations and how to make it a closed top hat. My testers remarked that it was so much easier to make than it looks! If you’re ready to impress your friends and customers with this classic houndstooth beauty, grab your instant pattern download, below, and get working on yours today. I know you’re going to love making the Kaydence Bun Hat and I so look forward to seeing your finished product! Won’t you share your photos with me? 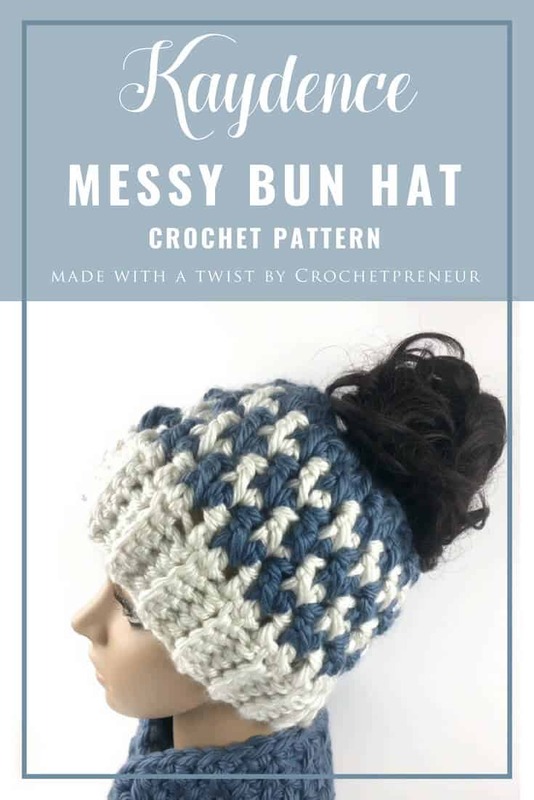 Create a project on Ravelry for your unique creation and link it to the Kaydence Messy Bun Hat Pattern. Follow me on Instagram and share your photos. Be sure to tag @thecrochetpreneur and use the hashtag #kaydencebunhat and #madewithatwisters. Roundups: You have my permission to use one photo in your roundup post as long as a link is provided back to the associated blog post. Thank you! © 2019 Montgomery Grice Enterprises Inc.. All rights reserved.